Imagine … you’re chatting with a potential client … trying to win a new project. The conversation turns to what exactly will you do to solve their problem. You’re good – you already have a sales pitch for this. You start talking about search engine optimization (SEO), keywords, usability, and all the other “buzz words” commonly used in your industry. Your potential client is thinking, “So what? !” because they don’t care about industry buzz words. To them, those words are “features” of your service. They want to know about (and understand) the “benefits” of your service. These features are great, but they fail to effectively sell your services because they don’t really answer your client’s main question: “What’s in it for me?” … at least in a way that your potential client can immediately relate to and desire. That’s why you need to turn your features into benefits. Benefits explain the value behind the features. They are the way you change your client’s life … Benefits are the real reason a client will hire you. First, make a list of all the features of your service … Features essentially tell you the what. Projects guaranteed to be completed by the deadline. They won’t have to stress about answering to their boss when it’s not done. They can relax knowing the project will be done on time. They don’t have to constantly follow up during the process. Truth is, you likely already knew what your client really wanted when you added that feature to your list. But, by taking the time to actually spell the benefits out for them, you’ll be able to sell your services more successfully. With WordPress they can update their website as easily as sending an email. So? No more bottlenecks while waiting on someone to make simple changes – like adding something to their online menu. They can interact with their customers – and sell more – by moderating their own comments – from the phone app. So? They can make sales even when they’re away from the computer! WordPress is free … So what? Well, they can spend their money on plugins for functionality, more advertising, or to take their team out for a celebratory beer once the site launches! 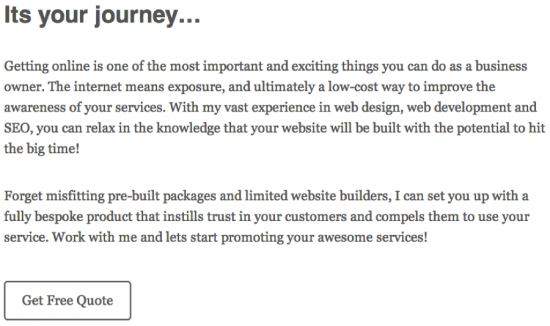 Aren’t those benefits more appealing – and more likely to sell your services – than listing “Built on WordPress” as a feature? Notice how he explained some of the benefits of working with him? More exposure … so what? You’ll reach more potential customers, which means more sales, a better business, and more money! Instills trust … so what? Visitors to your website will be more likely to hire you – meaning you’ll have better conversions and need to market less. 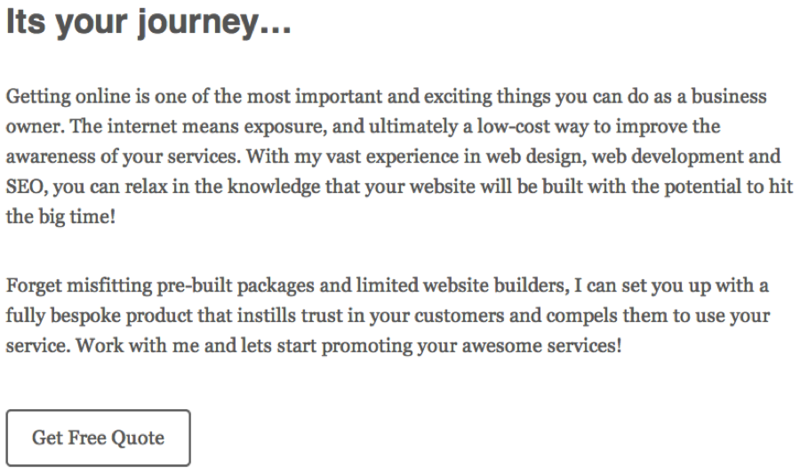 Also, you won’t have to work so hard to sell your services because your new website will do it for you! What benefits can you come up with for, “His experience means you can relax” … ? Now that you understand how to find your benefits, go through your entire features list, asking, “So what?” and turning your features into benefits. Notice how they listed the feature and then explained why it matters below? Website and application design … so what? Front-end web development … so what? His methods and experience mean your site will look good today AND be “future proofed” … so you don’t have to turn around and have it redone in a few months! What is the Deeper Benefit? So, how can we find the deeper benefit? 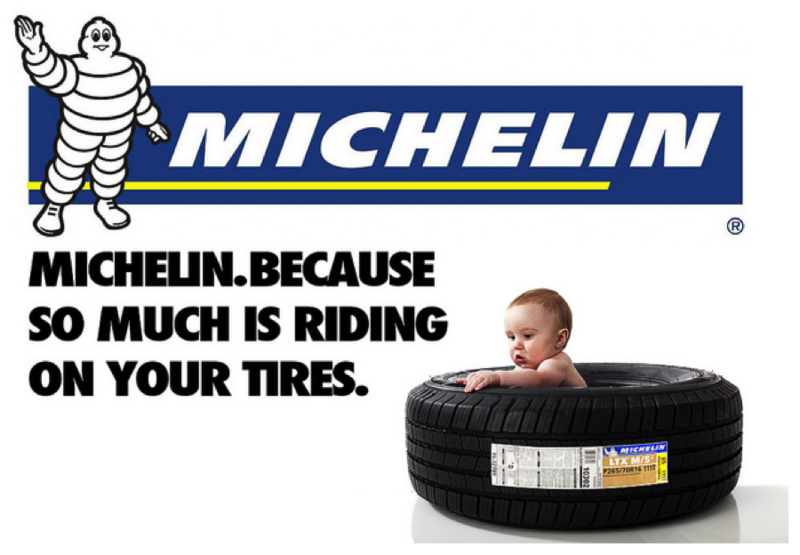 The Michelin tire can remove over 2 gallons of water per second from under and between it’s treads. It will help to keep your car from hydroplaning when the road is wet. Michelin tires aren’t just promising good tires and safety features. They’re promising peace of mind! Have you found the deeper benefits? Or do you still have some digging to do?